Where On Earth Are NASA’s Rovers Sending Pictures From? There is an increasing number of people who believe that NASA’s rovers never left the Earth in the first place, and the pictures they are allegedly sending back from Mars are taken in remote areas of our planet. But if NASA’s rovers are not on Mars, then where exactly are they? First of all, evidence suggests that the pictures that we see on NASA’s website are not even taken by the Curiosity and Opportunity rovers. One of the known locations where NASA is playing around with these small rovers is Devon Island, Canada. (It’s worth noting that Devon Island is “the largest uninhabited island on Earth,” which seems like a pretty good location for a fake Martian photo shoot). NASA base in Devon Island, Canada — even without the color filters, it’s strikingly similar to Mars, isn’t it? Sure, one could think NASA just needed a place where they can simulate the conditions on Mars, but what’s the point of simulating those conditions with miniature rovers, that look and work almost nothing like their bigger brothers? Their shape, size and weight are different and the wheels are worlds apart. It’s really impossible to make even remotely accurate tests. They also don’t have the on board laboratories, so what’s there to simulate? Except for taking pictures, the “baby rovers” look useless. The cameras mounted on the “baby rovers” have color filters already applied, but the final images — those that we get to download from NASA’s website — are color-corrected even further, until they get that fake, reddish color that is so familiar to us. We have been tricked into believing the myth that Mars is the “red planet” (even though all amateur telescope pictures show otherwise), so NASA is now only perpetuating the lie. Now I’m not saying that we could breath on Mars like we do on Earth, but where are the blue skies in NASA’s pictures? That reddish sorry excuse of an atmosphere is obviously fake. 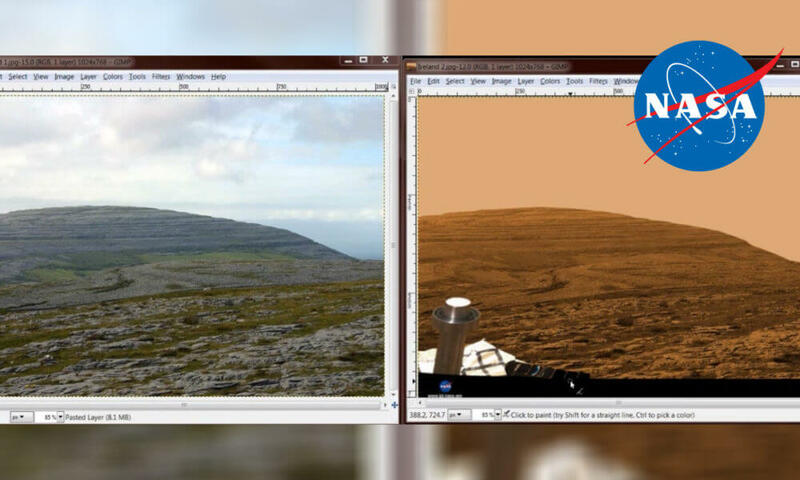 NASA admitted on numerous occasions to alter the colors of their pictures before posting them online, so that they look more like what we would see, if we were on Mars. “Getting the colors right is not an exact science,” says Bell. “Giving an approximate view of what we’d see if we were there involves an artistic, visionary element as well – after all, no one’s ever been there before.” However, great pains are taken to be as accurate as possible, short of going there ourselves. To give people a sense of being on Mars, scientists combine views through telescopes, data from past Mars missions, and new information from the current mission to create a color-balanced, uniform scene. Color-corrected mosaics simulate the view a person would see if all the images in the mosaic were taken on the same day, at the same moment. So, there you go. NASA is clearly admitting to “color correcting,” “color balancing,” and even “tweaking the colors” of their images, so you can see whatever they want you to see. Does it make any sense to you? Why not simply taking pictures of the environment AS IT IS? Why changing its color into something else? It’s the same old “the government knows what’s best for you” rhetoric, and the people have been tricked into blindly believing and obeying it without question. I mean, you haven’t heard anyone complaining about the “color tweaking,” have you? But the “color tweaking” is not all they are doing to the original pictures. NASA has been caught, more than once, faking entire environments of — allegedly — Mars. The media called it the “Mars rat”, but this is actually an arctic lemming and it is commonly found on— you’ve guessed it — Devon Island. Even if everyone is quiet and still, lemmings don’t stray far from their hiding areas. Radstock Bay, Devon Island, Nunavut, Canada. NASA’s technique of coloring the whole ground so to make it look like Mars (as you will see), made the small creature look like a rock — until someone with a sharp eye spotted it. In the following video, from minute 3:18 to 5:30, you can see just how easy it is to make any environment look like a Martian desert. The author of the video, Danny Wilten, takes a random picture from Earth (Ireland, to be more specific), where there is a fair amount of vegetation and even has a road with a white van on it. Now just imagine what a Photoshop expert can do with a picture that already had color filters applied to the camera, and was taken in a controlled environment (location, lighting, exposure, etc.). Of course, this either means that there are already humans on Mars (which I will talk about later), or that this image was taken on Earth. Quick recap: On Devon Island there’s an identical landscape as the one from NASA’s pictures (presented to us as Mars), they have permanent bases there, rovers fitted with cameras roaming around, and people fully geared up in astronaut suits. Corroborate this with NASA’s admission about editing the pictures before releasing them to the public and the fact that they have been caught more than once faking the landscapes, and the connection becomes crystal clear: the pictures are NOT from Mars! NASA’s mission to Mars is a sad joke (as you will see later on), the rovers have never left the Earth and The Powers That Be have stolen yet another $2.5 billion from the taxpayers’ money, to use for their black projects. (You should know that NASA has also used a secondary location on Earth for simulating the Martian environment, in the Mojave Desert. In that location, they train astronauts to walk around and do their daily jobs dressed up in space suits. It is also possible that NASA is sending their teams to various remote locations around the world, to take pictures of the barren environment — which they will later edit to look like Mars. They can even create fake environments altogether, by combining two or more images, or by adding/removing rocks, hills or even mountains). NASA’s rovers took some really strange pictures in the past — the bright orb changing position,hieroglyphs with pyramids in the background (personally, I suspect this image to be a composition from two or more pictures, and not an original landscape), a dome, etc., — so the following image was received as a yet another piece of evidence that Mars was not only inhabited in the past, but it continues to be even today. Here’s a picture, allegedly taken on Mars by the Curiosity Rover, that has caused quite a stir in the UFO community. Posted online by NASA, the following image clearly shows a disc-shaped object flying across the horizon. Unfortunately for NASA, they cannot discard this as a weather balloon, plane, or even a bird, as they usually do, because the picture was allegedly taken on Mars. So, they either have to admit that flying saucers are real, or that these pictures are taken on Earth. A truly impossible choice!